MANILA, Philippines - State weather bureau PAGASA said that the eye of Typhoon Chedeng (international name: Maysak) maintained slightly weaker wind speeds of 180 kph on Maundy Thursday morning, April 2, 2015. 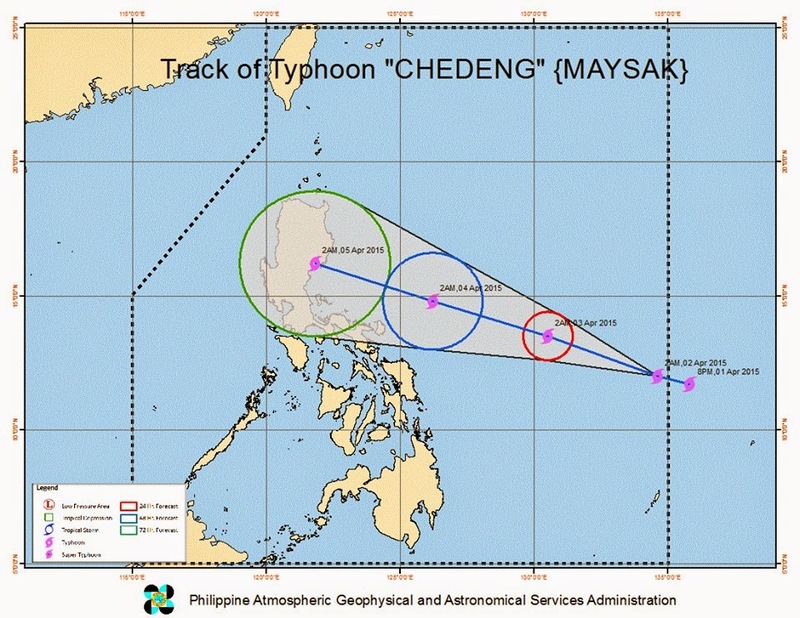 On its latest forecast, PAGASA said Typhoon Chedeng now at 970km East of Borongan, Eastern Samar (12.2°N, 134.2°E). It has gustiness of up to 215 kph and forecast to move West Northwest at 19 kph. 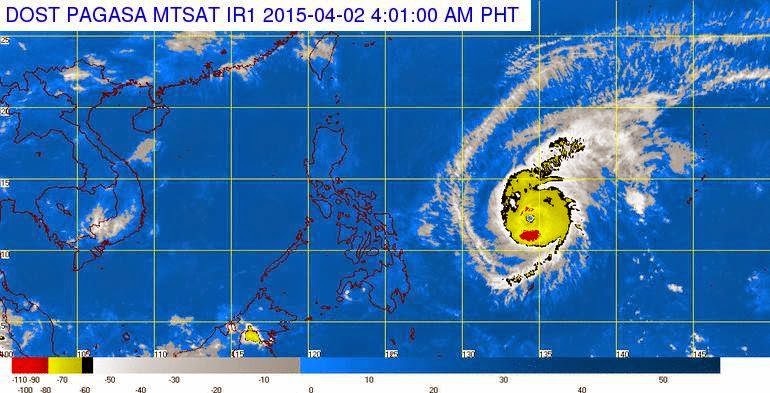 'Bagyong Chedeng' has entered the Philippine Area of Responsibility (PAR) late Wednesday. Within the next 18 hours, PAGASA will raise Public Storm Warning Signal 1 over Bicol and Samar Provinces. Hence, sea travel over these areas will be possibly suspended. 'Chedeng' is estimated to make landfall over eastern coast of Aurora, Quezon or Isabela by late Saturday (April 4) to early Sunday (April 5). The public is alerted against possible flashfloods over low-lying areas and landslides along mountain slopes particularly over Aurora-Quezon area. Storm surges and sea surface waves of up to 4 meters are possible over the eastern coast of Samar, Bicol and Aurora-Quezon. 24 hour (Tomorrow evening): 850 km East of Legazpi City, Albay. 48 hour (Friday evening): 620 km East of Infanta, Quezon. Weather added that the whole archipelago will experience partly cloudy to cloudy skies with isolated rainshowers or thunderstorms. Moderate to strong winds coming from the northeast to north will prevail over the eastern section of Southern Luzon, Visayas and Mindanao and the coastal waters along these areas will be moderate to rough. Elsewhere, winds will be light to moderate coming from the northeast to east with slight to moderate seas.